I started this blog to help women from all walks of life find their inner pinup girl. And by that, I don't mean wearing glamorous attire, I mean finding your inner confidence as well. One of the main reasons women don't embrace Pin-up culture is because they don’t think they’re good enough - For some reason, they think they have to look and be a certain way to dress like or be a Pin-up Girl. But it’s not like we're born perfect with no self-esteem issues or struggles. 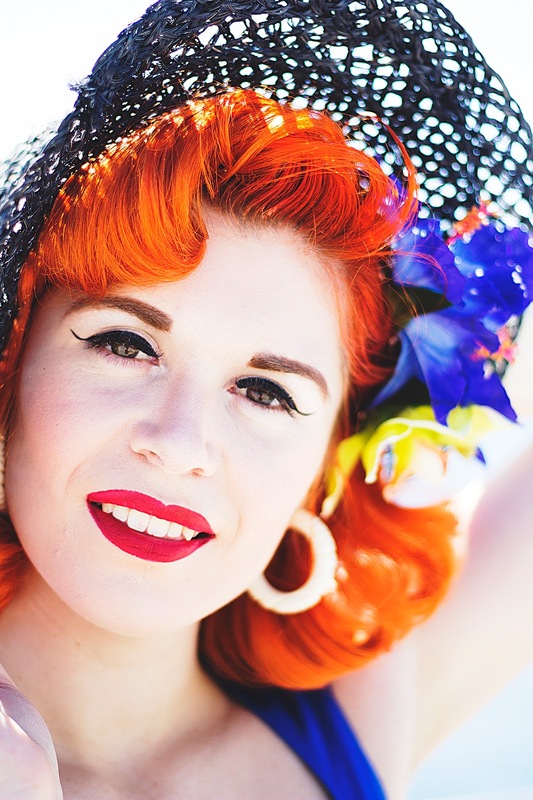 I talked to a few fellow Pin-up girls and asked them about their journeys to becoming the women they are today and how the Pin-up community has treated them. "When I was 16 I had no clue of my style or who I was, I tried to follow the styles of the high street and what was in fashion magazines but it never suited my curvy shape and gave me no confidence. In my town, a new boutique opened up called 'Deadly is the Female' specializing in Faux Vintage Fashion. I had a prom dress disaster and on the day of my prom had to find new accessories. I visited 'Deadly is the Female' to buy some shoes and fell in love. Immediately what drew me to the vintage fashion was the glamour! From that day I started exploring vintage fashion via vintage reproduction brands as this was more accessible and affordable. It's only been in the past few years I have started buying true vintage pieces because I have a greater appreciation and care for these incredible pieces. The girls in the pin-up community have your back no matter what! The pinup community is so caring and supportive, it's just wonderful. I have met so many incredible friends through this community and I've been able to learn so much about vintage style. I also adore that we can totally geek out about vintage fashion, hair styling and more with each other! When a new collection is released I can message friends and they get just as excited as I do about buying new pieces! It's so lovely to have a group of people who understand and share your love and passion. Find what works for you as an individual and makes you unique. There are so many beautiful girls out there who are great for taking inspiration from, that's why I love Instagram. But what I have learned is what may work for them may not work for me. Don't just copy others, be you! I'd also recommend starting with a capsule collection of pieces that can be interchanged to work with each other such as pencil skirts, blouses, cigarette pants, a little black dress etc. Some good key pieces that can work to create many different looks is a great place to start." "It all started 6 years ago during a time when I had lost confidence in myself and struggled with my appearance. At that time I started to watch Mad Men and I instantly fell in love with the diversity of shapes and characters shown there. I couldn't take my eyes off Joan Holloway, she really caught my attention! My grandma had kept all her belongings (including beautiful Loewe pieces) in her wardrobe and I thought it would be a great opportunity to give them another life and try to channel Joan. And since that day, I've never looked back! My fascination for Rockabilly and Soul music also helped me go for a change. Amazing and challenging as well. I had never felt so empowered before and proud of what I've become. At school, I used to be the weirdo and tall girl who would often get told she was fat and ugly. But not anymore. The pin-up community has helped me embrace my beauty and, most important, meet other women with the same interests as me. I'd also like to add that I've learned a lot in the past years and I owe it to the pinup community. Sometimes I wish I had discovered the scene in my teens! Both my family and friends supported my change. They've always been very supportive and, although sometimes they seem to not understand my way of life, they don't judge me by my looks. But with the general public, it's the opposite: people stare at me and even think they have the right to comment on my outfit/appearance. At first, it did affect me but now I just laugh at them or ignore their comments. Find your own style and embrace it. It's also important to start step by step because changes take time. We've all been there. Try adding a vintage twist to your outfits and gradually changing your style to your liking." "I started slowly transitioning into dressing in retro style around 4.5 years ago. When I was in high school I had a school uniform and didn't really get an opportunity to express myself through my clothes, but I always admired the silhouettes of the 40s, 50s and 60s. When I was in undergrad, I got to explore with my style a little more, but I was still held back by societal pressures about current trends, even though I hated how things fit on me! I grew up having a mom who always dressed in skirts and dressing and I came to associate that ultra feminine look as synonymous with being a powerful woman. So once I became more confident, I let my personality shine through my clothes. I am currently the only pin-up in my area, at least that I know of. But my experience in the pinup community online has largely been wonderful. In more recent years I've started to notice some bullying and harassment, but for the most part, I would say it's been quite pleasant. There's a lot of lovely women out there that I wouldn't have otherwise had the opportunity to meet, and that has been so rewarding! My whole family is super supportive and happy with it, especially my mom. She loves the style and wishes she had worn it when she was my age (even though I tell her she can wear it at any age)! My friends are so used to it now that they don't even notice it, which is pretty cool. As for the general public - the reactions are mixed. I live in a pretty conservative city so I get openly gawked at in public, especially when shooting blog photos. But I haven't really gotten openly nasty comments, other than the time a guy on a bike spat at me and my sister, calling us ugly. One thing I've noticed is I don't get harassed by men on the street as much when I'm in full pinup - I think it confuses or intimates them. So that feels pretty powerful. My biggest piece of advice would be for girls to not be afraid to slowly transition, or only dress in pinup when they feel like it! I slowly transitioned over the course of a year until I was fully confident. These days I only get to pinup on weekends, but I still consider myself a true pinup girl. Pinup has done oodles for my confidence, which I've been able to apply in other areas of my life. I want aspiring pinup girls to know how freeing it can be to dress how you want, regardless of what people think!" "I've always had a fascination with the 40s/50s and always took Halloween as an opportunity to live my best pinup life. About a year or so ago I discovered a beautiful lady @lonicatherine on Instagram. Loni dresses in pinup without an occasion. She seemed so happy and confident and it was so inspiring! I used Dapper Day events at Disneyland to slowly develop my own confidence to dress in pinup without an occasion, and now I try to do it at least every weekend! I am actually a very introverted person. I don't have many close friends, but most of the close friends I do have actually came from the pinup community. I've met some of the most wonderful inspiring and empowering women online who I am so lucky to call my friends. I think it takes a lot of confidence to walk around in public dressed in pinup, and it took some real getting used to for me. Because people aren't used to others dressing that way, they tend to stare. Getting so much attention in public was very intimidating at first, but eventually, it really helped my self-confidence. I learned to not worry about what other people are thinking and to just focus on how good I feel in my clothes. My advice to be yourself and not compare yourself to others. No amount of pinup is too small or too over the top. There's no need to compare yourself to other pinups because everyone's beautiful in their own way. (Oh and my second piece of advice is learning how to properly do your hair takes forever. I've been doing it for a year and now I feel like I've finally got it! Don't get frustrated! Just keep doing it and practicing.)"